"A life-like strategy game in which you get to control a character's life choices." A life like strategy game made by Positech Games, Kudos 2 is the second game of the Kudo series of life simulation games. 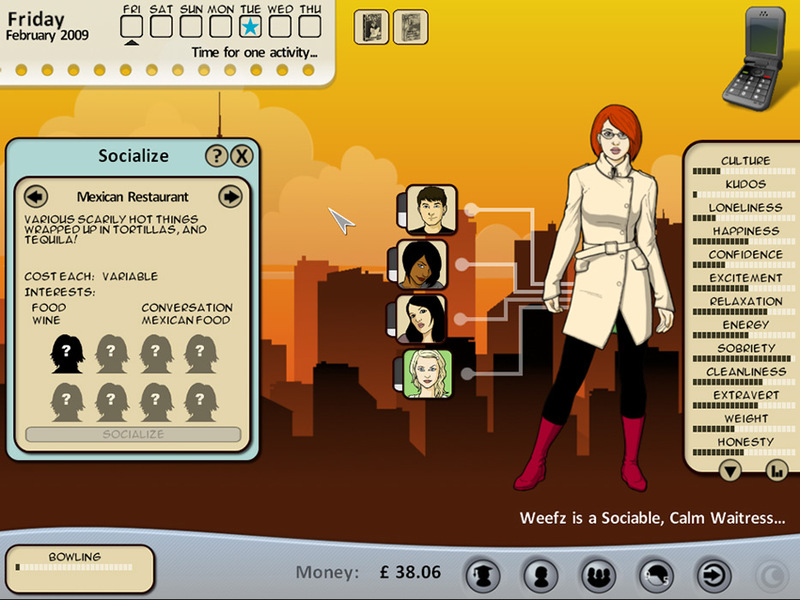 Kudos also inspired Electronic Arts to create the game SimSocial, which had a lot of ideas that originated in the original Kudos game. Kudos 2 is a turn-based video game for Windows that puts you in control of a character by managing their life from the age 20 to age 30. While you do this, you get to go through social activities in the game and make new friends while you go out. You get to choose your friends since you are the one controlling the character. Not only that, but you get to also choose the job your character has in the game, as well. When there is free time in the game, you are also able to have your character spend free time in any way that you please. There are many big choices that you get to make in the game that will make a large difference in your character's life, so choose wisely. Do you want to put more time into work or with friends? Do you want to spend time looking for a better job, or put more time into your hobbies and free time? You get to choose, and these choices will define your character's future. Kudos 2 uses original artwork with a cartoon-like style with a lot of customization to keep the players happy with how their characters look. Each and every character you make will be completely unique and will always encounter different things in their life. Not one person will be the same as another.